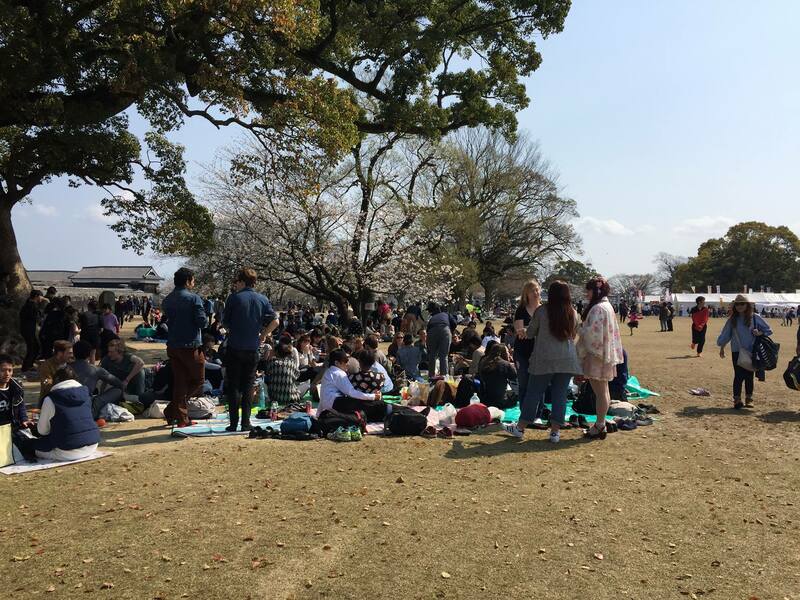 Christine: On March 24th, JETs from across Kyushu gathered together in Kumamoto Castle’s Ninomaru Park to enjoy the 2018 All-Kyushu Hanami. 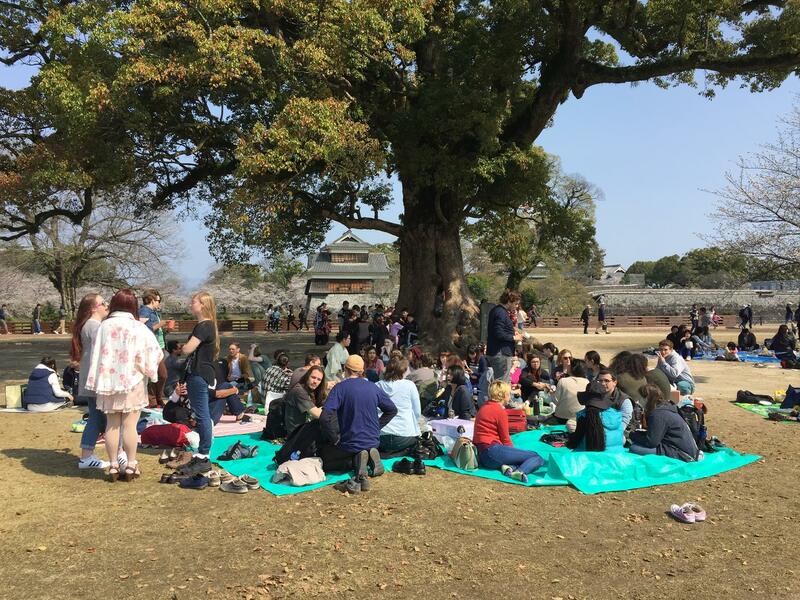 With over 60 participants from as far away as Nagasaki and Miyazaki, this was an awesome opportunity to meet our fellow program participants and create memories under the cherry blossom trees. What was your Inspiration for organizing the event? 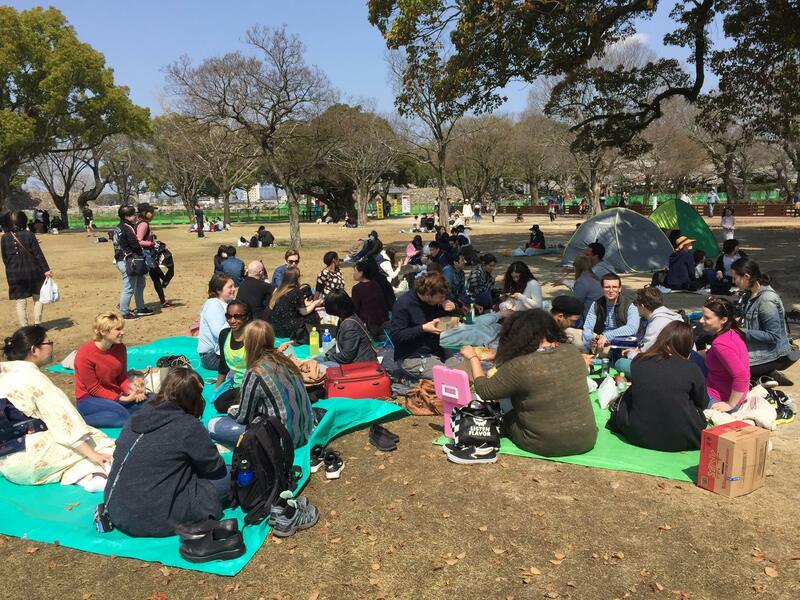 Robert: Last year’s hanami by Kumamoto Castle was held as a celebration of the JET Programme’s 30th anniversary, and impressed by the turnout, it was decided that it would happen again this year in hopes of making it an annual event and giving people a reason to visit this charming city. 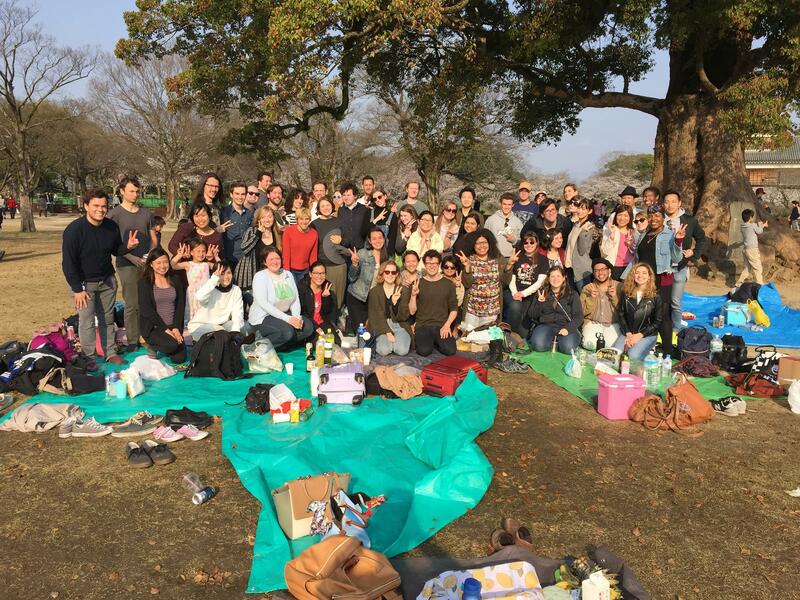 Robert: Our turnout was lower than last year, but I was pleased to see a large turnout from Block 11, especially those from Kumamoto and Kagoshima (shout-out to the lone Miyazaki JET who made it out). On Block 10’s end, I was happy to see a good-sized group of Nagasaki JETs attend, as they are the furthest from Kumamoto and don’t have the best access to the prefecture. Oita and Fukuoka JETs made it out, as well. How did the Hanami go? Christine: In addition to our planned festivities, the park was host to a weekend-long Yosakoi Dance festival featuring troupes from across Japan. Many attendees spent the day moving around to enjoy the stunning floral views, visiting the local shrine to see a wedding, watching the priests bless new cars, and watching the dance performances while enjoying local festival foods. The park certainly lived up to its name as one of Kyushu’s best places to see cherry blossoms, as almost every path was overshadowed by clusters of white and pink. Needless to say, this made for an exciting weekend! Robert: For nijikai, the majority of us went to a nearby karaoke joint while a smaller group enjoyed the nightclub, SANCTUARY, which is worth checking out if you’re in town! Robert: All in all, it was a great night, and we got to know even more JETs from across the island. Many thanks to all the JETs that made it out this year, and special thanks to Christine as co-host — we were constantly in touch despite never meeting face-to-face until the event. Christine: Overall, the event was a huge success. JETs from all around Kyushu were not only able to strengthen bonds with their local community, but also pay a visit to an incredibly beautiful and historic location right in our backyard. We are certainly looking forward to next year’s All Kyushu Hanami. Robert Troy Fisher is a third-year American prefectural ALT in Hiji-machi, Hayami-gun, Oita Prefecture, and is the National AJET Block 10 Representative. When he is not juggling several responsibilities at once, he indulges in all of the fried food his prefecture has to offer, incessantly quotes RuPaul’s Drag Race in his head, and longs for a genuine Mexican bakery filled with conchas and tres leches cake. Christine Zawlocki is a 3rd year ALT in Kanoya City, Kagoshima Prefecture and the Block 11 Representative. She was very excited to continue the tradition of the All Kyushu Hanami alongside Robert this year. When she finds free time, she enjoys eating questionably sized portions of food at her local market, distance running, and singing Zankoku na Tenshin no Teze at karaoke nijikais.